Copyright July 2009 by Wendy Palmer, all rights reserved. Once upon a time, when wishing still worked, a princess whose beauty dazzled the sun lost her golden ball down the well of her father's castle. Peering down the smelly dank shaft, she wept for the loss of her favourite toy. But she had a hundred favourite toys and this one might have soon been forgotten if a frog had not heard her distress and retrieved the ball for her. He held it between clammy webbed toes and regarded her with eyes as golden as the ball, resting on the edge of the well. The ball had sunk straight to the bottom and he had dived a long way through silty water to reach it, and strained hard to carry the heavy thing back to the princess. But the princess did not heed his gasping and held her hands out for the ball. The princess was neither surprised at the frog's human tongue nor alarmed by his request. She took the ball from him and ran back to the castle, and thought no more of it. 'Is this so, daughter?' the king demanded. The princess hung her head, and the frog was allowed in. 'She must feed me from a golden plate,' he said. The princess demurred, but the king well knew the two-edged sword of obligation. He insisted. His daughter, his youngest and most precious, laid delicacies of chicken liver and white asparagus upon the tongue of the frog while he lolled upon a gold-threaded satin cushion. She finally had to smile at his contented greediness. The king circumspectly sent back a certain titbit, a delicacy made to a recipe recently come from France, so as not to upset their unexpected guest's appetite. 'Frogs aren't slimy,' said the frog, placidly. Even the king glanced askance at the guest. But she had promised, and so she would obey. 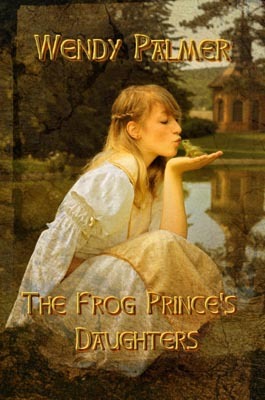 The princess was determined and smug in her trickery, but a glimmering sadness in the frog's eyes touched her heart. She laid her head upon the golden pillow and did not flinch, not even when the frog snuggled into her hair. The thought of kissing the frog repulsed her but she had learnt her lesson. She placed her soft lips to his and was surprised by their warmth. The warmth grew and grew and suddenly there before her stood a tall and handsome prince. The princess could do no other than profess her undying love. As is so often the case, they lived happily ever after.